When you’re new to songwriting, it’s often easy to have your lyrics sound very basic. We’re generally taught how to rhyme in school, so when we start out writing our first song, often we go back to what we’ve learned and the lyrics end up sounding quite simplistic and basic. The problem is, there are only so many words you can rhyme together. Furthermore, we’re used to rhyming certain words together. So unless you make a conscious effort to bring in a different rhyming word, your song will sound like hundreds of other songs already out there. 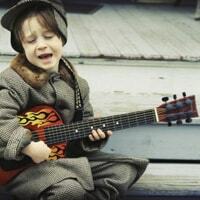 So what can you do to make your songs sound less simple and like they were written by a child? Well, while I’ve already given you some tips for writing a song, here are some that will deal with this particular problem. This will help if you’re concerned your lyrics sound cheesy. Despite what many people initially think, you don’t have to rhyme your lyrics to make a good song. In fact, making your lyrics rhyme is one of the biggest factors of your first songs sounding simplistic. 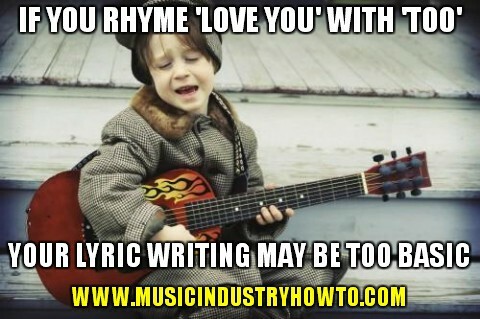 While I’m not saying you should never rhyme your lyrics (rhyming is still an important part of songwriting), if you’re having difficulties making good songs, you may want to try to avoid this at the beginning. Instead, you should focus on these two things. First of all, you should focus on telling a story. Instead of adding words to your lyrics simply because they rhyme, just make sure everything you say makes sense. So for example, set yourself a task of writing a song about an everyday task you do. This doesn’t have to be a song you record or release, but write it just to get used to structuring better lyrics. So for instance, let’s say you’re writing a song about shaving. Simply tell this story as it is, and don’t change the story just so the last word of each sentence rhymes. Of course, if you tell a random story that sounds awkward to the ear, it won’t make a very good song. Because of this, even if you don’t rhyme, it’s important you make your lyrics flow well. By this I mean the song has clearly defined start and stopping points, it doesn’t sound like you’re trying to fit too much in each sentence, and your second line sounds good after your first line (and so on). The key is to avoid your lyrics sounding forced. Write the song so it sounds like your words are flowing out naturally. Be a confident lyricist. One last point: try to avoid watching commercial songwriters too much, at least when you’re first starting out. A lot of these songs a based on cheesy rhyming, simply because catchy songs sell. 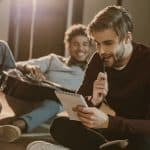 And while you may want to go into this kind of songwriting in future to sell more records, it’s good to learn how to write original and creative songs as well. So avoid these initially. So there you have it, some top ways to stop your lyrics sounding too simplistic or childish. If you have any other ways to do this, please leave them in the comments section below.